THE KITCHEN IS MY FAVORITE SPOT OF A HOUSEHOLD. 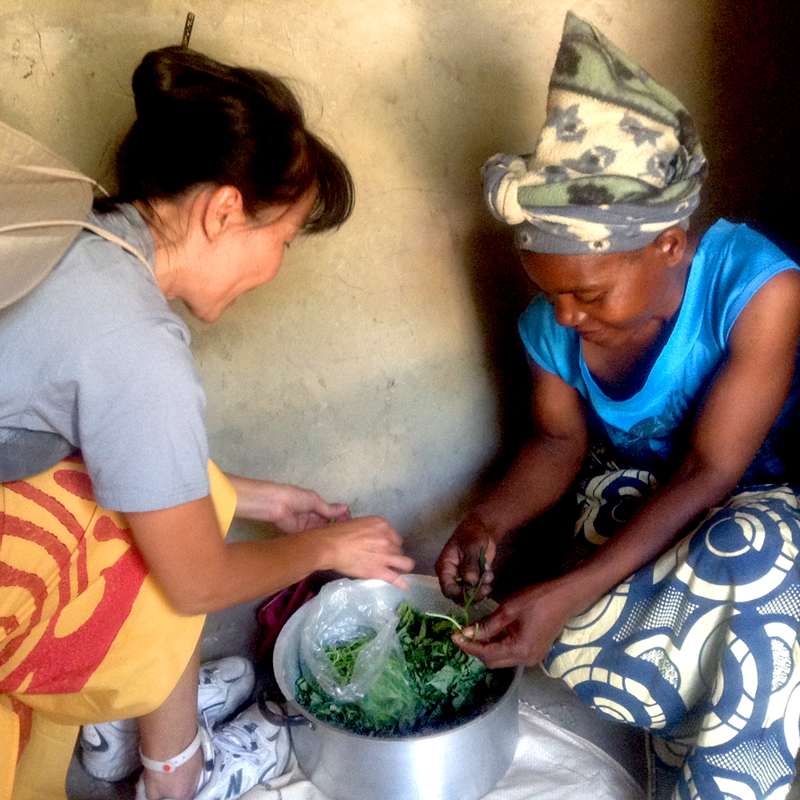 VISITING MARKETS, COOKING LOCAL FOOD, AND SHARING MEALS are excellent ways to explore and familiarize with indigenous cultures and people. The goal of Hands at Work is to care for 100,000 orphaned and vulnerable children through its USAID “best-practice” model of community care. 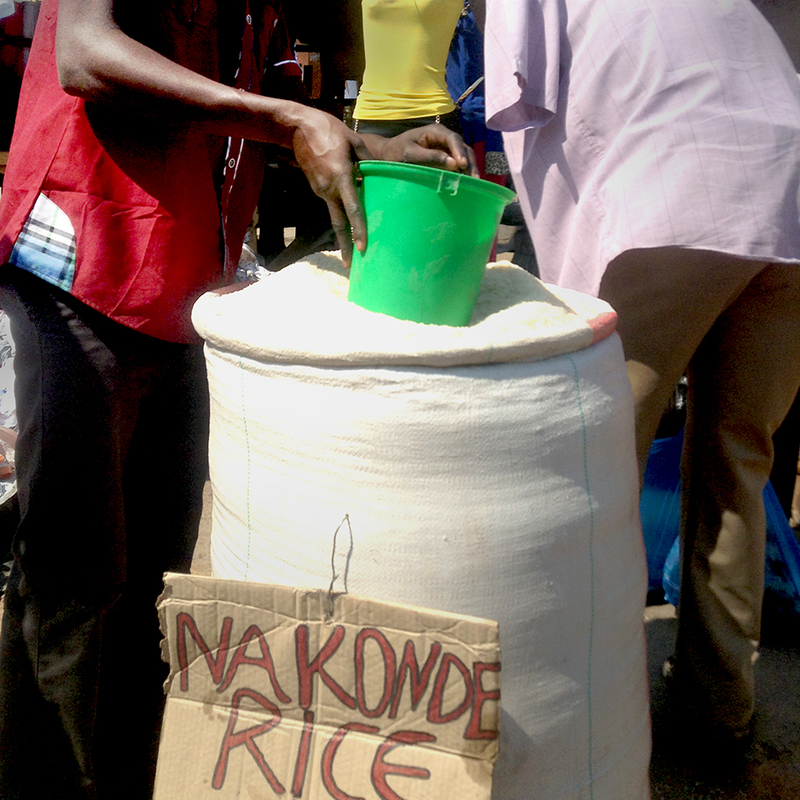 One of Hands At Work’s focus is providing access to food to the most vulnerable children in their community. 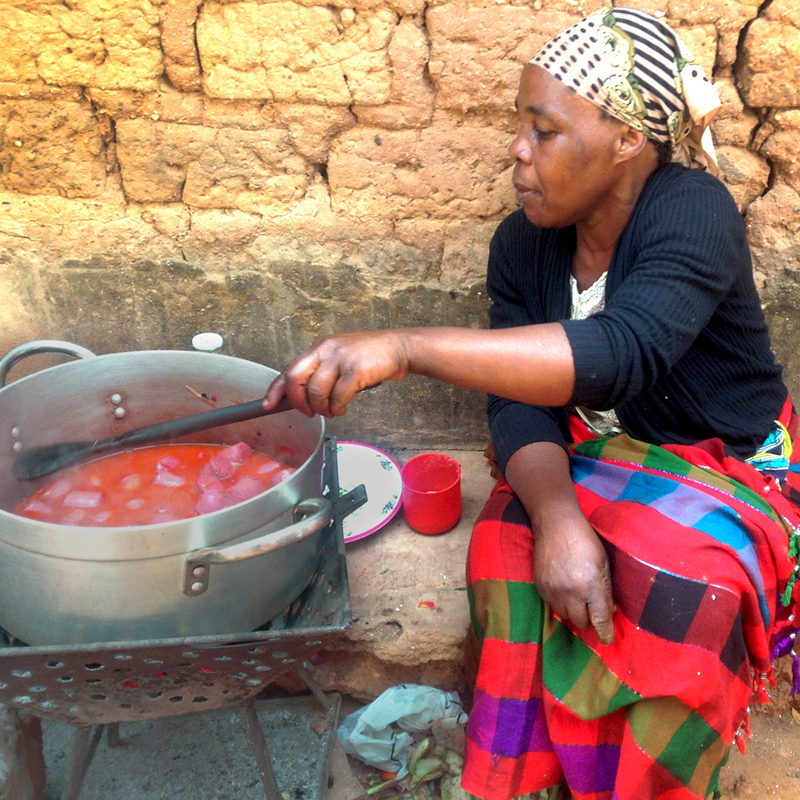 Part of our team’s integrated group activities to support the Zimbian Care Workers is to share food preparation responsibilities with them. Being someone who loves to cook, I naturally volunteered for the task to prep, cook, and serve the food along with the Care Workers. 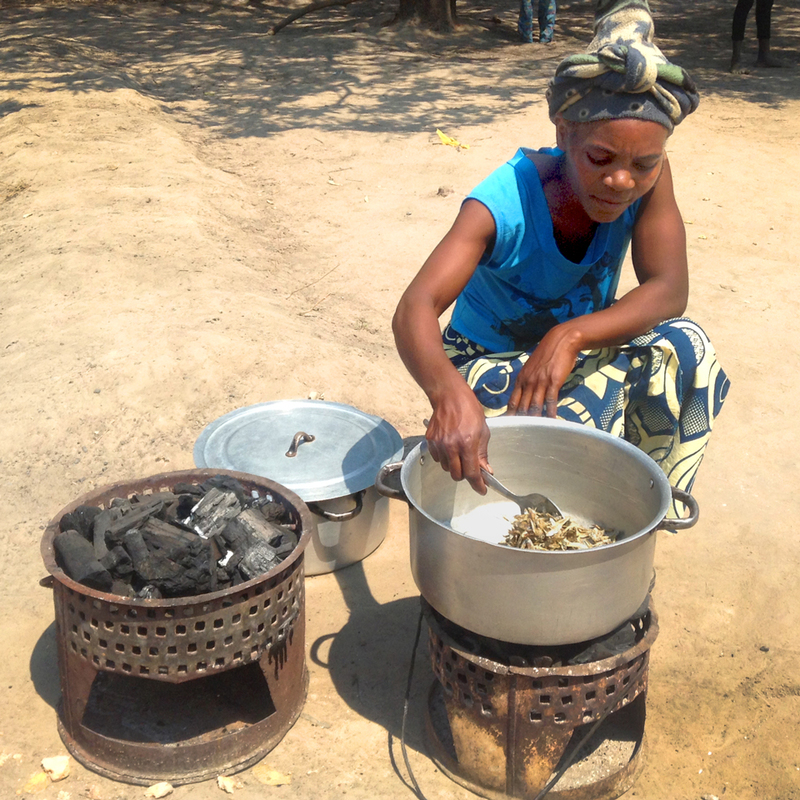 Nshima is a staple food in Zambia and Malawi (nsima). Made from maize flour (AKA mealie meal, a very ﬁnely ground corn meal) and water, it has a similar taste and consistency of Polenta. 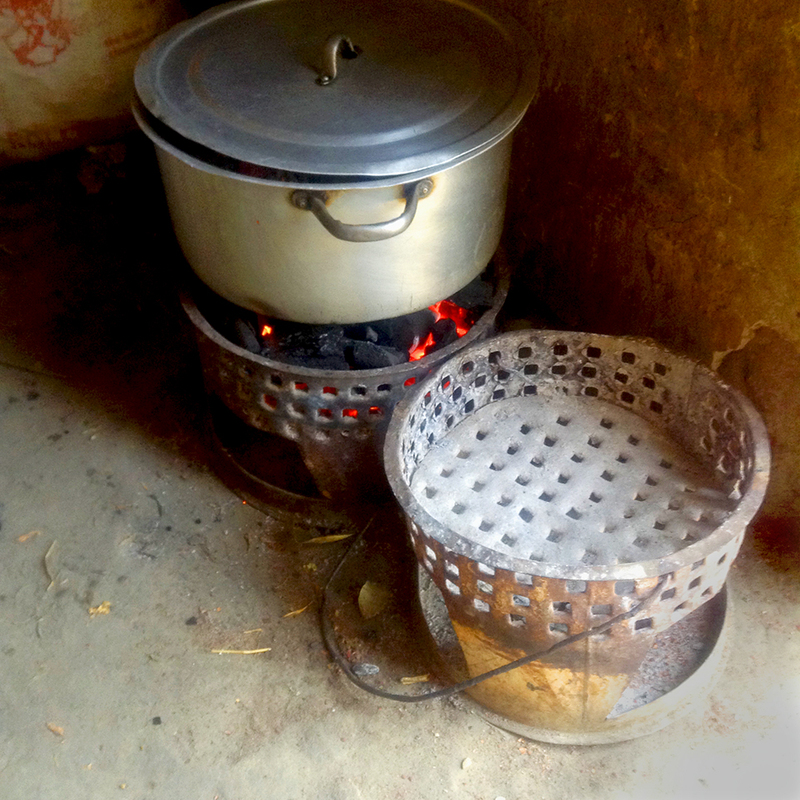 In Zimba and other rural communities, nshima is often cooked outdoors, in large uncovered pots over open charcoal ﬁre. 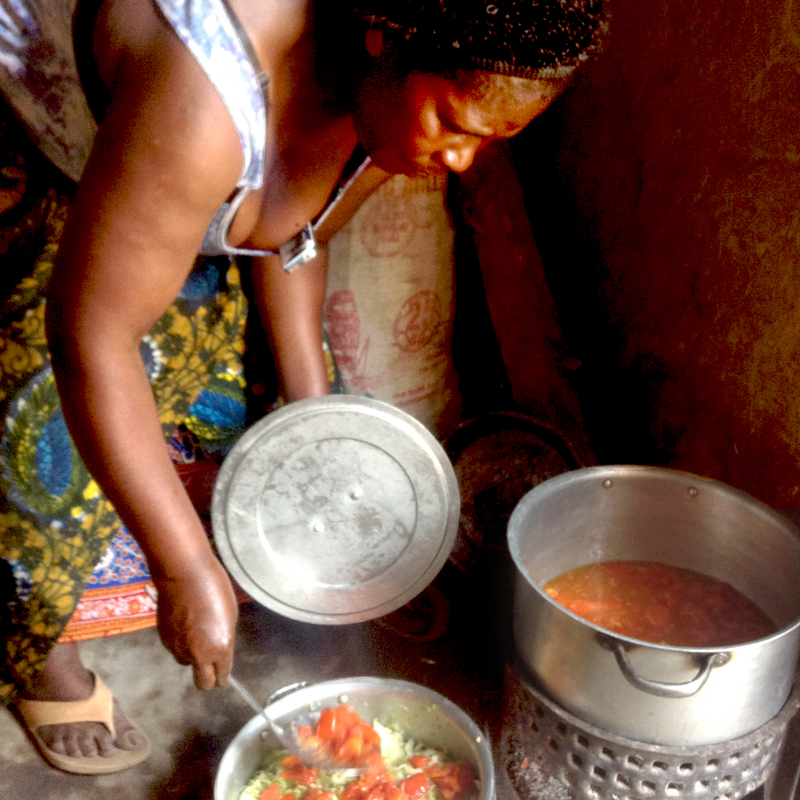 In the beginning of cooking, a relatively smaller amount of mealie meal is added to a larger portion of boiling water, then slowly add more mealie meal, stirring vigorously—like making risotto—turning the nshima thicker and heavier. 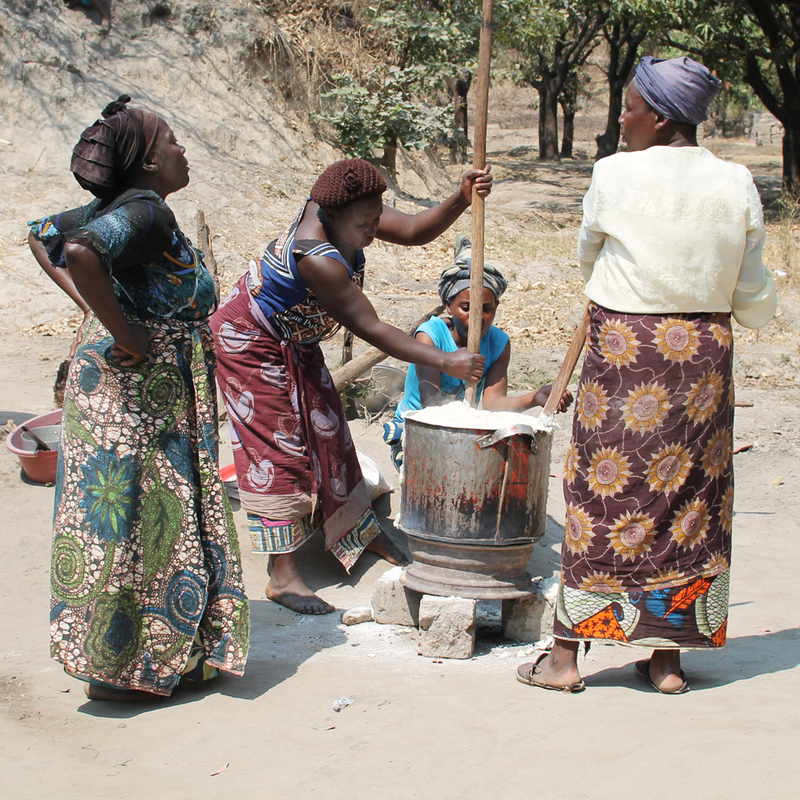 Often it is a two-person job both helping to stir the nshima with long wooden spatula as it thickens, and a third to slowly add the mealie meal into the pot. It looks easy but when I tried making nshima it was such a workout! 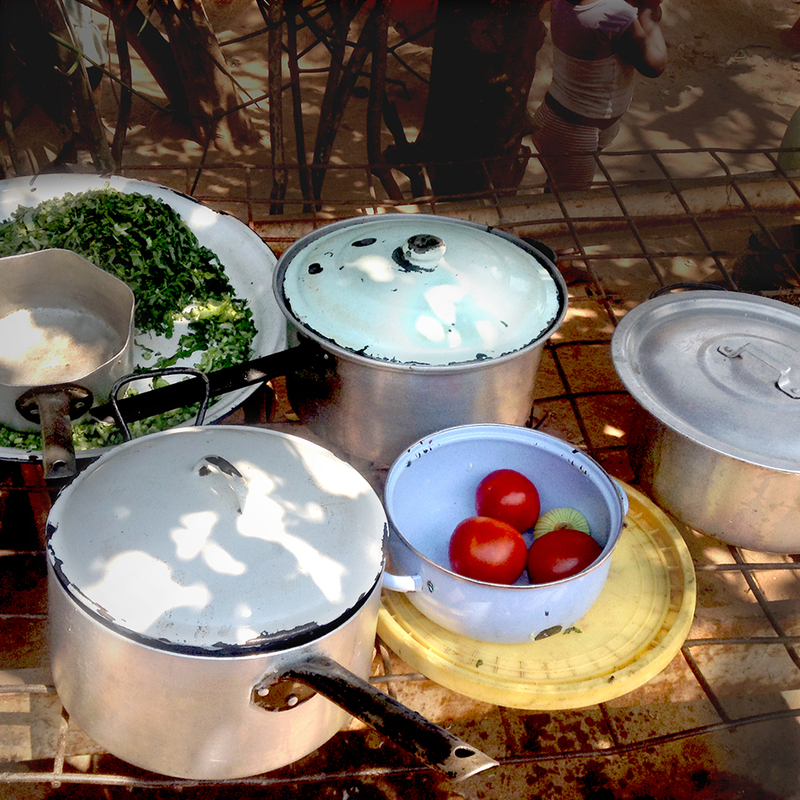 Side dishes often are boiled/simmered vegetables—kale/leafy greens, sweet potato leaves, pumpkin leaves, onion, tomatoes, beans, and nuts; free range chicken—plenty of them in the communities; sausages; and dried salted fresh water ﬁsh—“Kapenta” small-sized Tanganyika sardine and “Isabi” larger-sized Tilapia. Meals are eaten with the hands. 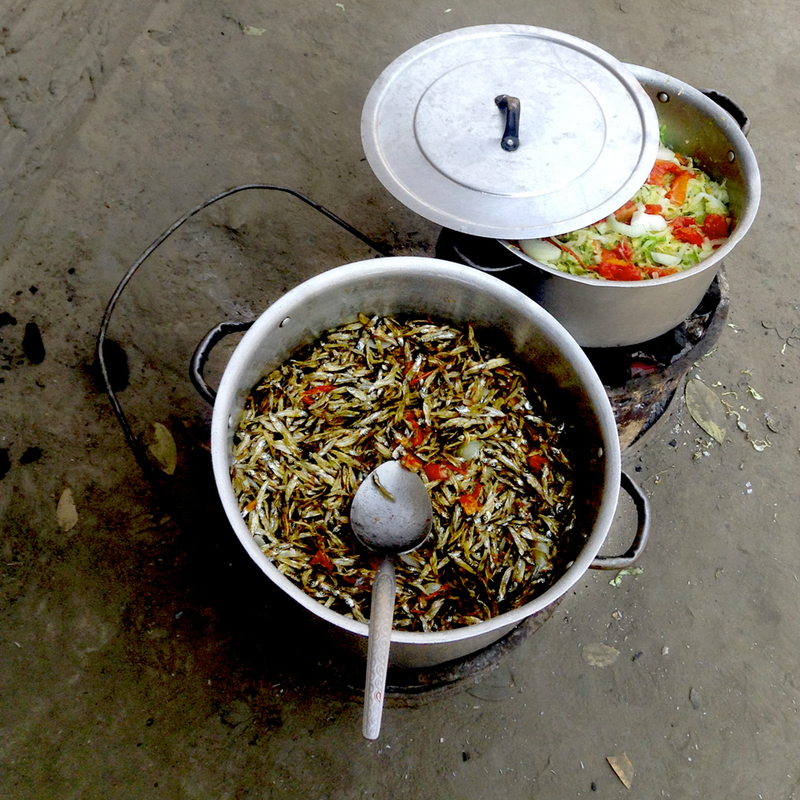 Nshima is served in lumps and most often with boiled meat or ﬁsh in a tomato-based sauce. To eat nshima, ﬁrst break off a piece then kneed it in the palm of the hand into the size smaller than a pingpong ball. The locals make an indentation in the ball then scoop up the side dish served along with it. Eating with ﬁngers makes the food extra tasty! 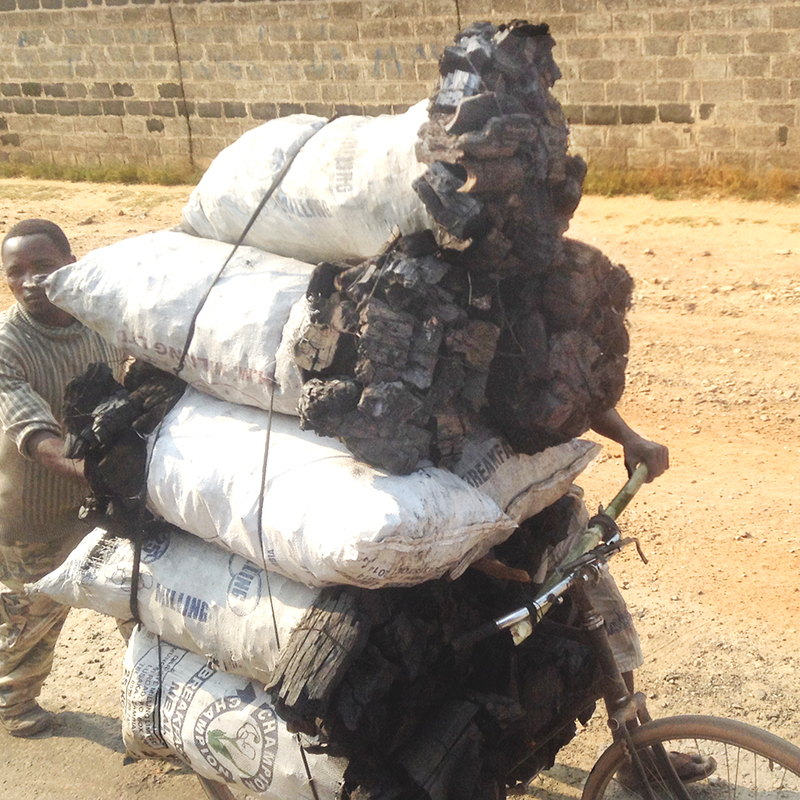 Charcoal for cooking transported by bicycle. 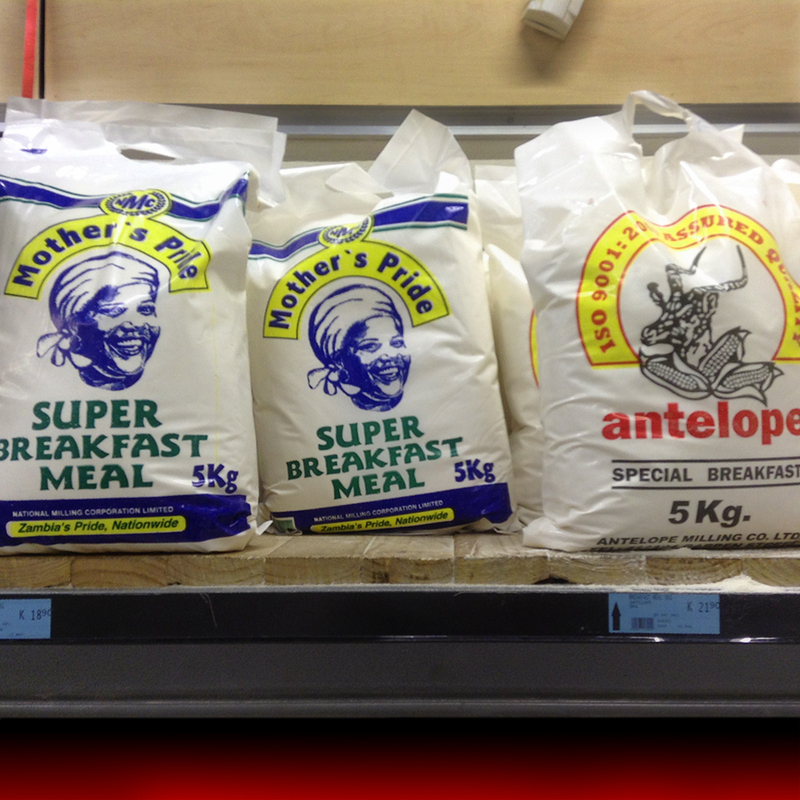 Pick ‘n Pay Stores | Mother’s Pride Breakfast Mealie Meal—A relatively coarse ﬂour made from maize. 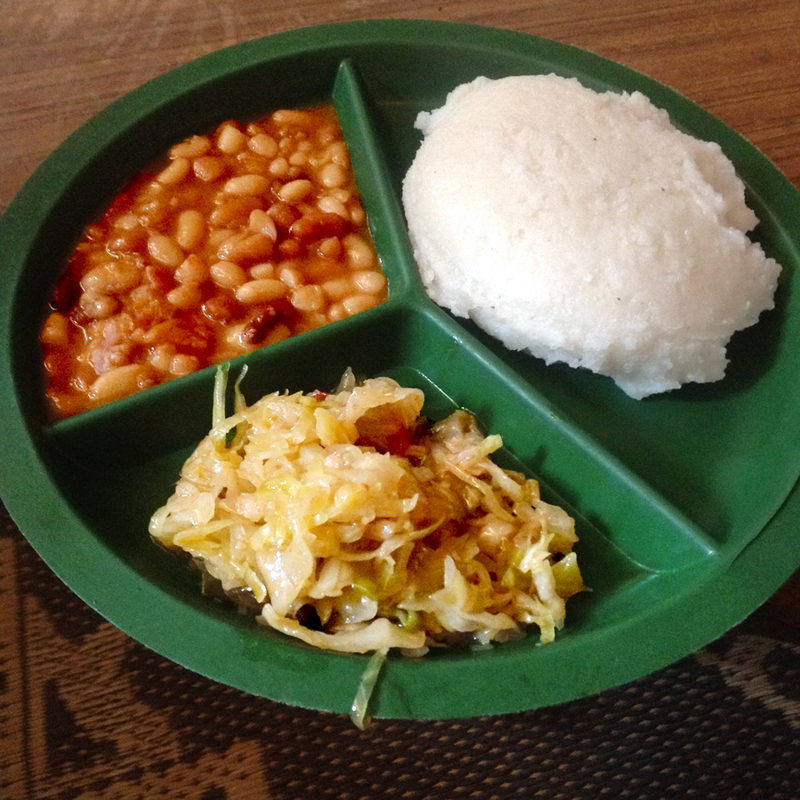 It is a staple food in South Africa, Lesotho, Zambia, Zimbabwe, Malawi, Botswana and many other parts of sub-Saharan Africa, traditionally made into uphuthu, sour-milk porridge, pap, and also Umqombothi (a type of beer). 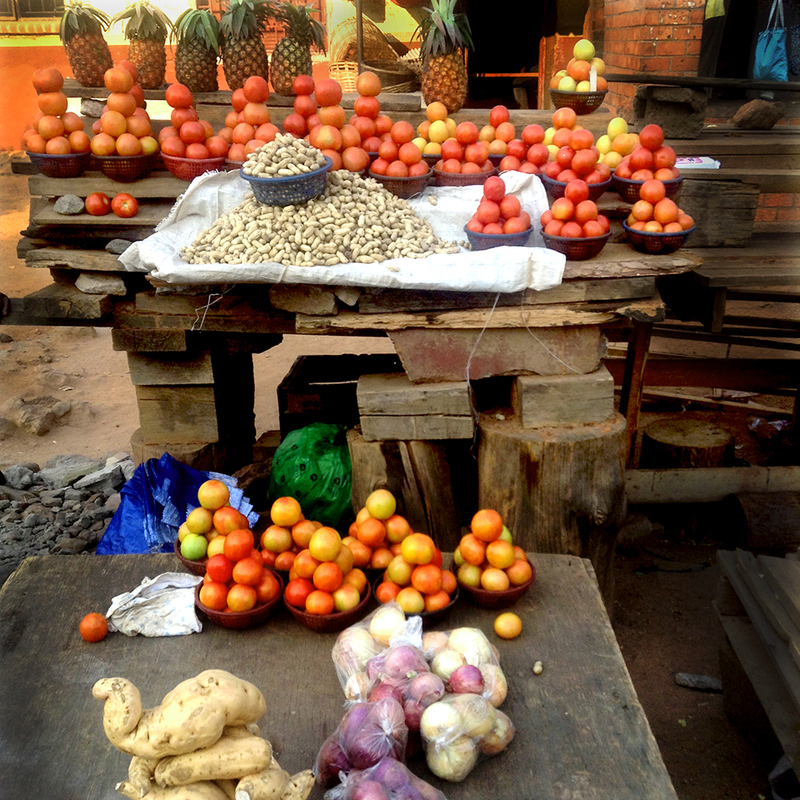 Roadside produce stand. Love how the items are neatly displayed. 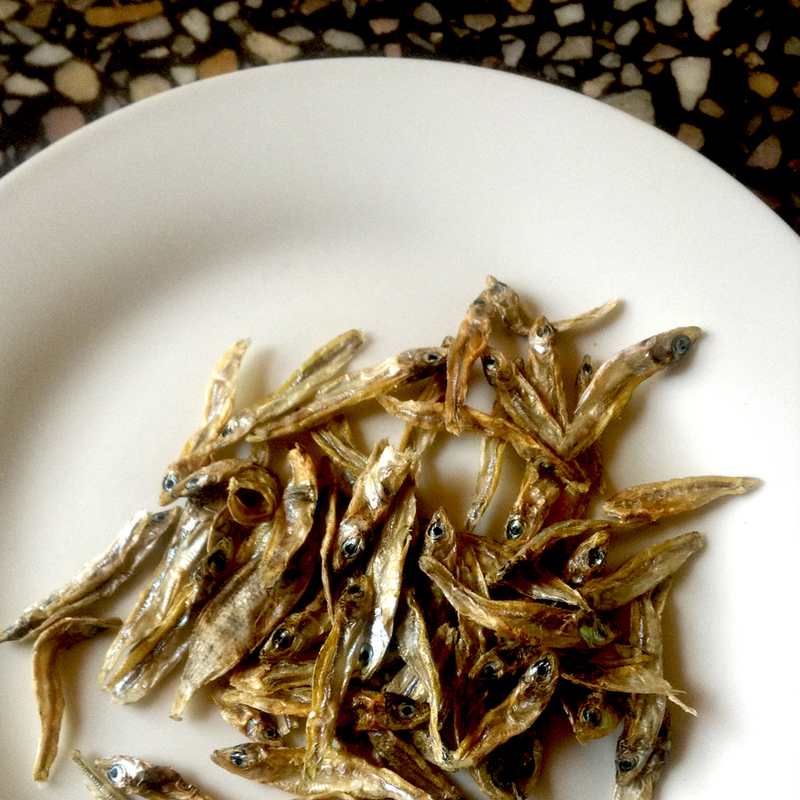 Kapenta—A small, freshwater ﬁsh that is dried and salted. 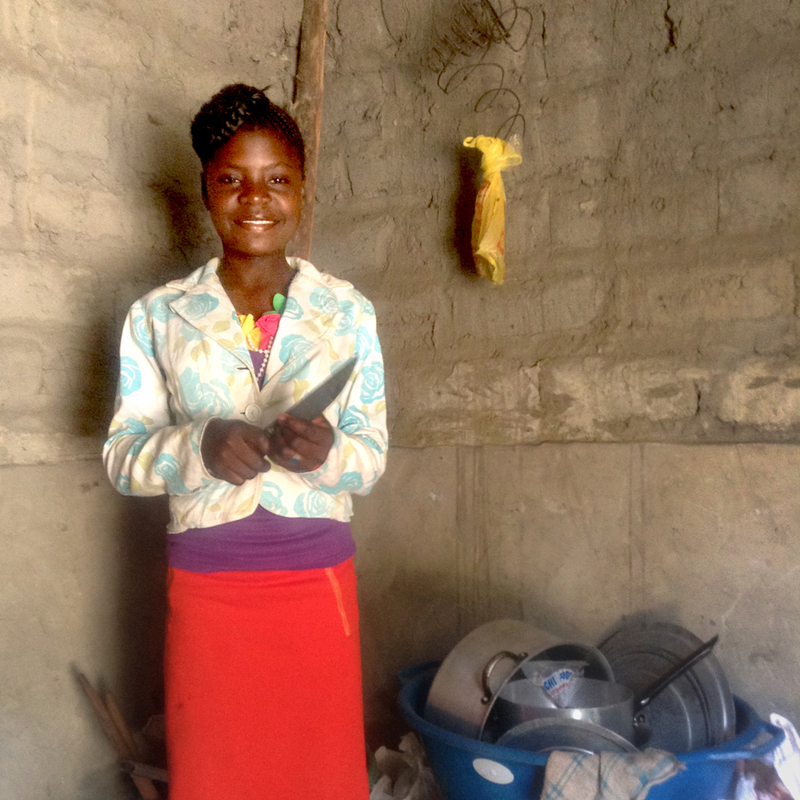 Zimba | Some Children Helps in The Care Centers’ Kitchen. That’s Some Knife Skill You Have There Annie! 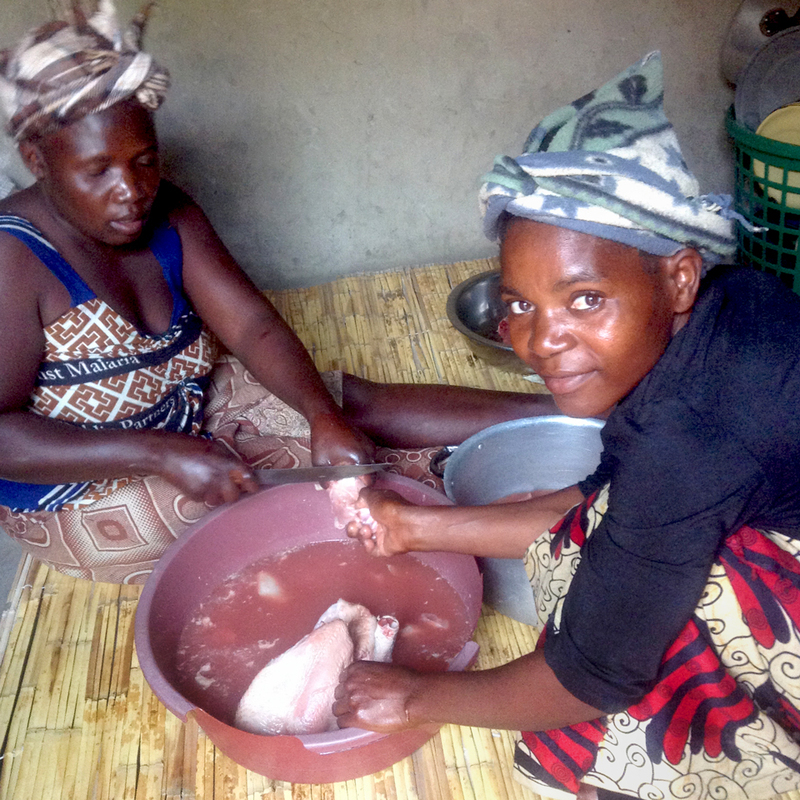 Zimba | Hilda and Teresa Prepping Chickens. Watch That Thumb! 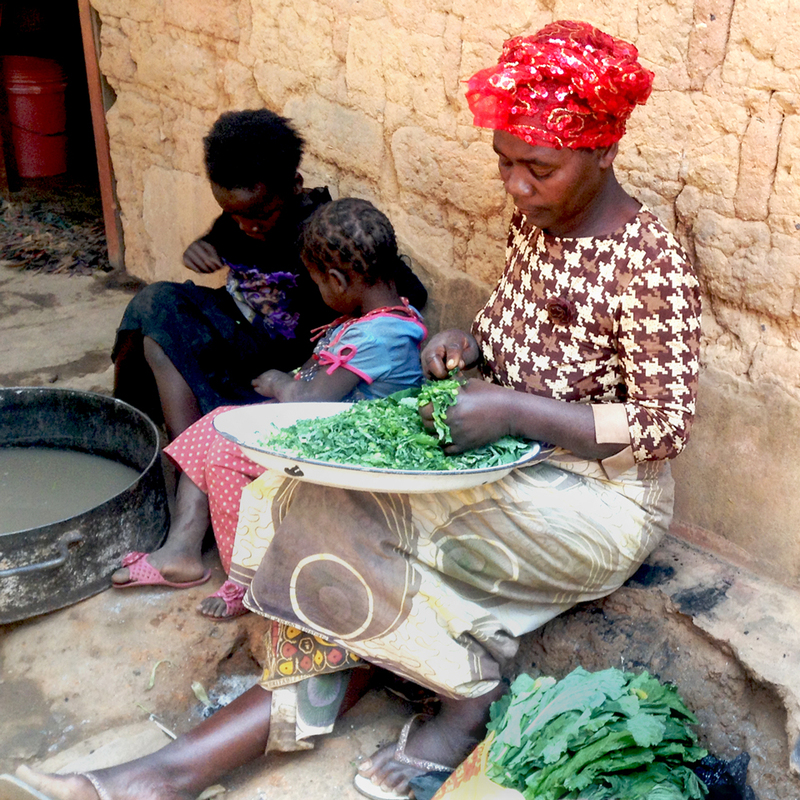 Zimba | Insansa and Tontonkanya Prepping Vegetables. Returned Home with All Fingers Intact. Photo courtesy of Abe Lee. 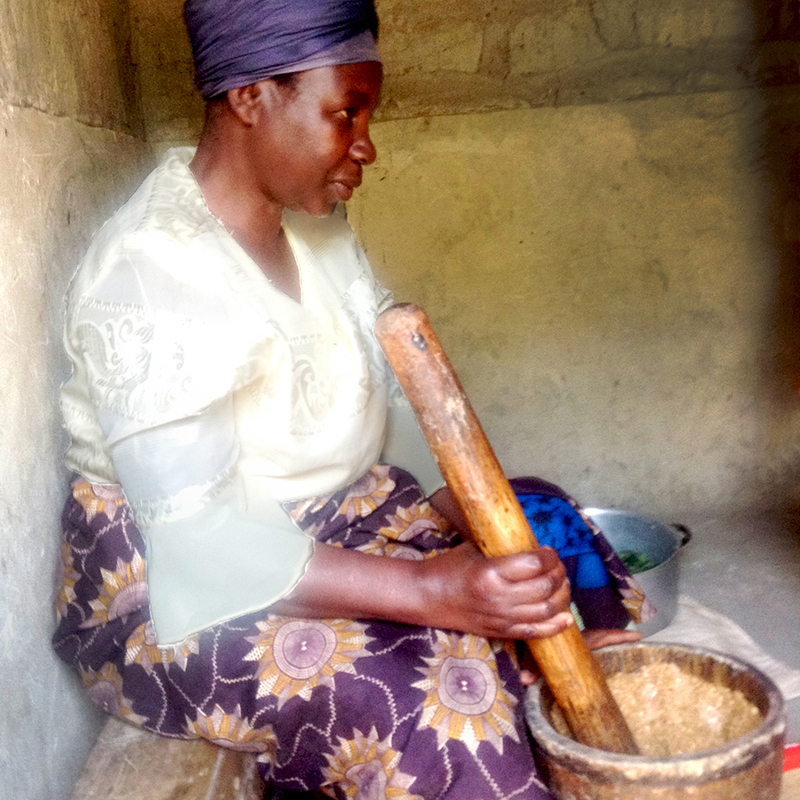 Most impressive is the care workers culinary skills by necessity—cut with dull knives while holding the food items in their bare hands without having cutting boards, holding and steadying hot pots and pans without kitchen mittens, pounding nuts single-handedly with a wooden mallet and mortar, and one word NSHIMA! 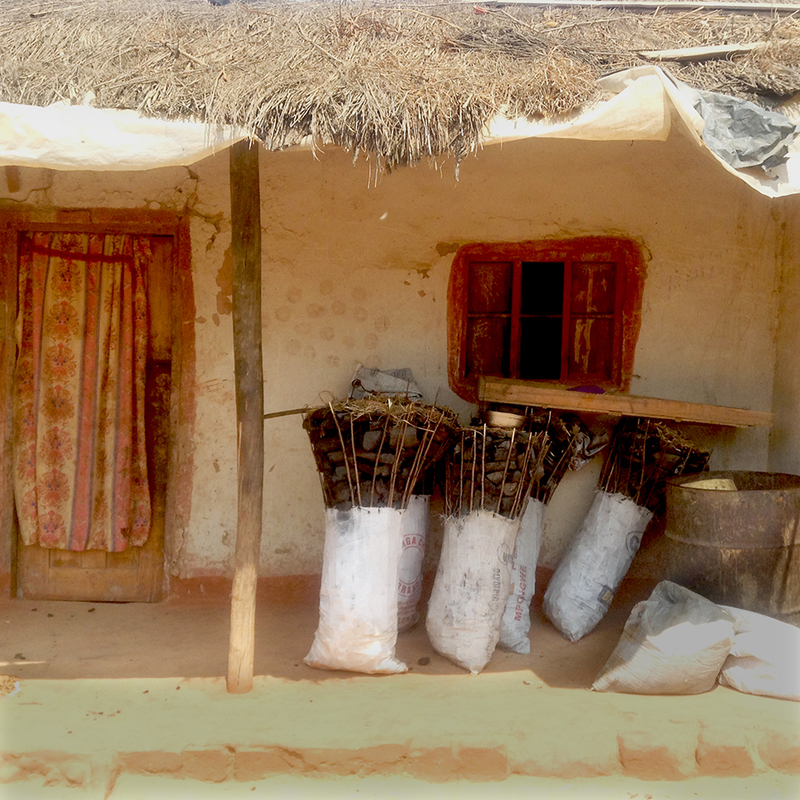 Zimba | The Masters Making Nshima. Photo courtesy of Abe Lee. 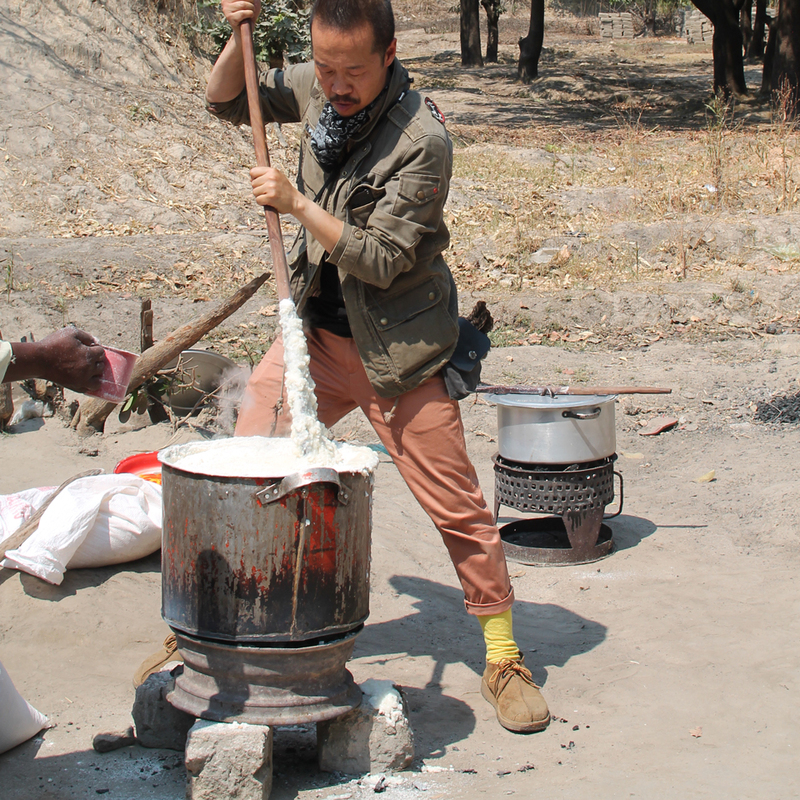 Zimba | Novice Tontonkanya Making Nshima. Photo courtesy of Abe Lee. I have learned so much from them, particularly of cooking with love. 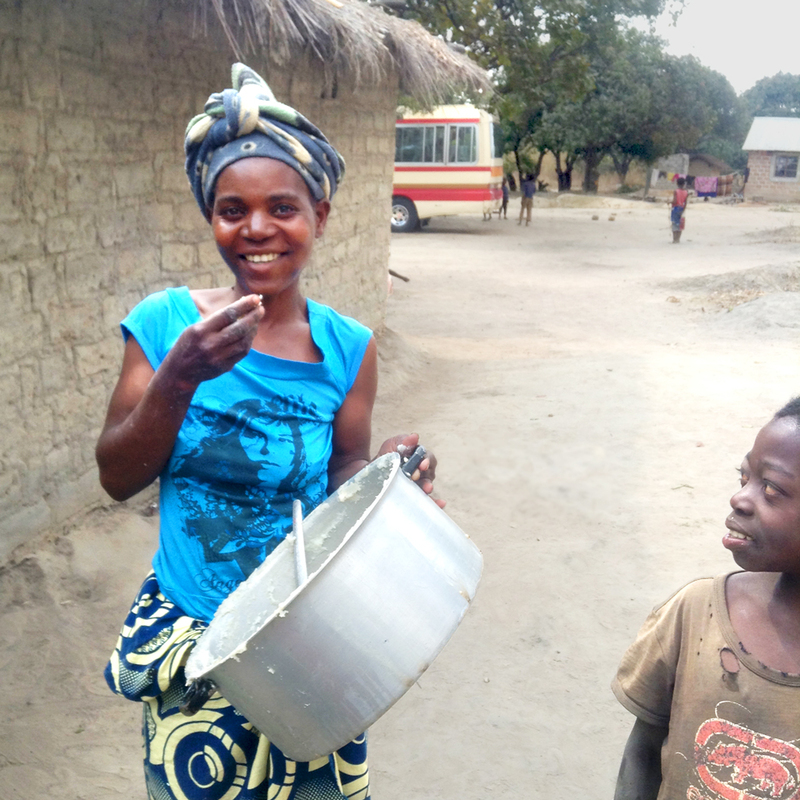 Will always remember the Care Workers’ smile when they cook, and the joy of the children when they eat. 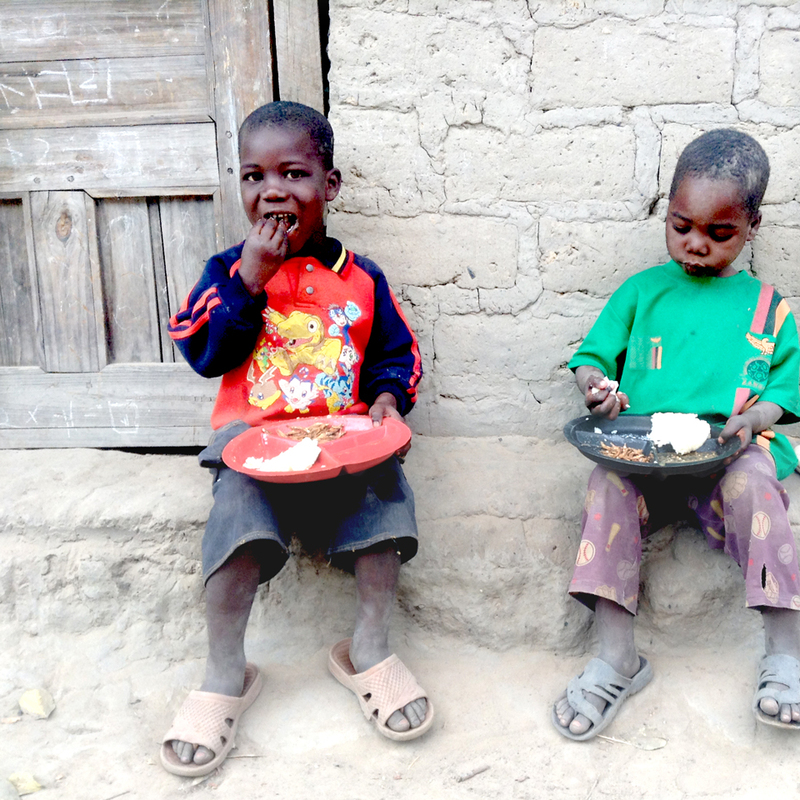 Header image: Dished lunch for the children in Zimba, often it is their only meal of the day. This really is actually fascinating, you are a quite specialist blogger. Iv’e joined your rss feed and sit up for looking for more of your excellent posts. Also, I have shared your web site in my social networks!